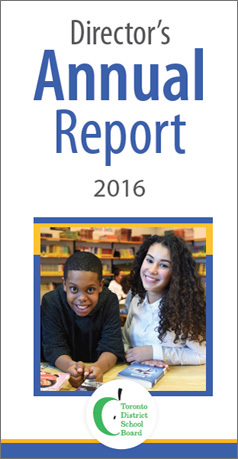 I am pleased to present the 2016 Director’s Annual Report for the Toronto District School Board. This year has been a busy one at the TDSB, and thanks to the collective work of all staff across the system and our Board of Trustees, it has also been incredibly productive. Over the course of 2016, we have made significant progress forward and are a strong, unified group working together for the students we serve. With the new Learning Centre structure and the introduction of our Vision for Learning and Integrated Equity Framework, we have begun very important work aimed at bringing resources closer to schools and students. Through this transition, we have remained focused on our vision to provide each and every student with the conditions necessary for achievement and well-being. I am privileged to serve as Director of Education for the TDSB and I look forward to building on the successes of this past year as we continue our work to improve achievement and well-being for all students.